I searched the Internet for this story and found it only on a couple of blog posts, and neither post listed a source for the story. I revisited a video feature of Fidrych in the early 1980s on youtube, thinking maybe he mentioned it there, but it didn’t turn up. I read a long 1986 Sports Illustrated article by the great sportswriter Gary Smith, who depicts Fidrych as somewhat adrift and rueful about being cast out so abruptly of the wonderful dream that was 1976, but the story wasn’t in that article either. So, in essence, at least as of this moment, Tom Veryzer exists in my mind as a footnote used to define inconsequentiality in a conversational exchange that may not have ever happened. But while the throng in Detroit may not have come to the ballpark to see a light-hitting shortstop who would soon be shipped to Cleveland to make room for Alan Trammell, I come to these cards to see Tom Veryzer. I come to see every player that ever arrived in my hands as a kid and seemed, by their very presence in the cardboard, to be something better and more lasting than the flimsy uncertainties of everyday life. And while a certain sunny and powerful glow comes off the cards of superstars, the cards of guys like Tom Veryzer exert a quieter but somehow stronger pull on me. You have to lean close to hear what the cards of guys like Tom Veryzer are saying, and that’s when they grab you and don’t let go. To say Tom Veryzer is inconsequential is to say that this life is inconsequential. Years later, long after anyone had come to the park to see Mark Fidrych, the Bird, who could have easily descended into a deep gap of bitterness over how quickly it all ended, continued to be grateful for all he’d seen and to all who’d once thronged to the park to see him and cheer his name. I remember Tom Veryzer on the 1982 Mets. Looking back, Veryzer is another one of those players that I just scratch my head and wonder how the heck did he have a 12 year 3000 plate appearance baseball career. His lifetime numbers are: .241/.283/.294, 61ops+, (-5.7) negative WAR. He couldn’t hit for average, couldn’t get on base, he didn’t have any power, and he wasn’t a good fielder. There’s no way a player like this would last more than 2 or 3 years in today’s baseball. It’s interesting that his last At Bat in the major leagues came during a famous game, game 4 of the 1984 NLCS. He lead off the top of the 9th with the score tied 5-5 and made an out. IN the bottom of the ninth, Garvey hit a two run home run to win the game. Veryzer was the poor man’s Roger Metzger or Enzo Hernandez with more pop. When he was a Cub, he was the only middle infielder I ever saw with a beer belly. “by their very presence in the cardboard, to be something better and more lasting than the flimsy uncertainties of everyday life”– That’s sort of the summation of this site. Veryzer almost looks like he’s hiding behind his glove. I liked this card, though. That’s funny about Veryzer’s unusual shape at shortstop for the Cubs. His protruding belly also features in the Sporting News story linked to in the post above: it was one of the things that made beanpole Fidrych’s use of Veryzer’s ID to buy beer so hilariously ludicrous (Fidrych had forgotten his own ID and the bartender didn’t believe the goofy kid-like pitcher was over 21). I always liked the “block” letters DETROIT on the Tigers away pull-over jersey rather than the script button-up version they wear today. – maybe you’re over-intellectualizing – or just sprinkling some literary gravitas onto the idea that there are no inconsequential stories. This passage did, however, make me realize that if any of the chains or larger shops that are carrying your book choose to file it under “sports,” and they have enough stock so that the “baseball” works are all grouped together, you’ll probably be settling in dust-jacket to shoulder, (or cheek to impressive jowl), next to your new neighbor, that dean of poetic flagellation and king of the artfully-turned overstatement, George Will. Now I’ve never really been able to digest Will’s florid prose about “green cathedrals” and “the objective meritocracy of sport,” and so on without an unexpired pack of Immodium… I don’t know, maybe it’s his disagreeable political views, or the fact that the print in any article I’ve ever read by him somehow inexplicably always appears to be about 35% smaller than anything in the rest of the publication. But anyway, perhaps you can take some measure of delight in potentially sharing shelfspace with Will’s excruciatingly longwinded, weighted exegeses on Proust, Ibsen and the Chicago Cubs; if not, there’s always the possibility that “Cardboard Gods” will be filed in another section. I stopped in at a Barnes & Noble branch on West 82nd street recently, and they had you faced out – though on a low shelf, mind you – in the slightly roomier “New Biographies” section. You may be happier to know you were sharing a narrow stretch of mahogany next to an enormous deposition on the life of Schopenauer. ramblin’ pete: Funny you mention George Will–that’s exactly who was next to my book in the Borders here in Chicago. On the other side was Robert Whiting’s Ya Gotta Have Wa (a good book). I heard that my book was right near the new Oprah bio in the Barnes & Noble on Union Square. To reply to the first reply… I think at times sabermetrics can be misleading, sometimes they are like seeing the forest while ignoring the trees. There are valid reasons that Veryzer had a long major league career, and it wasn’t simply because baseball people back then were stupid. Granted, scouting and statistical analysis weren’t what they are today… But Veryzer brought something to the table… he is listed as having the 26th best range factor per 9 innings for the history of the shortstop position… Granted, that stat is loaded with guys packed closely together… but the guy was doing something right with the glove… he made a historically impressive share of putouts during his career at shortstop. He hit over .270 in two of his four years as the primary Cleveland SS and .251 overall. Hardly cover-your-eyes awful in those days for SS. I would be fairly certain that those awful Indians teams had nothing better to offer and more pressing upgrade needs at other positions. Once Cleveland did have something better, then Veryzer was nothing more then double switch / defensive replacement bench fodder for a few years with equally crappy NL teams. He had a four or five year stretch when he was a serviceable shortstop, considering he played for some of the worst teams in baseball… and every other season he was a bench guy. I don’t see any great mystery as to how he stuck around considering the circumstances of the teams he was with. As far as this card… I vaguely recall going after this one and ’78 Tito Fuentes in trades. 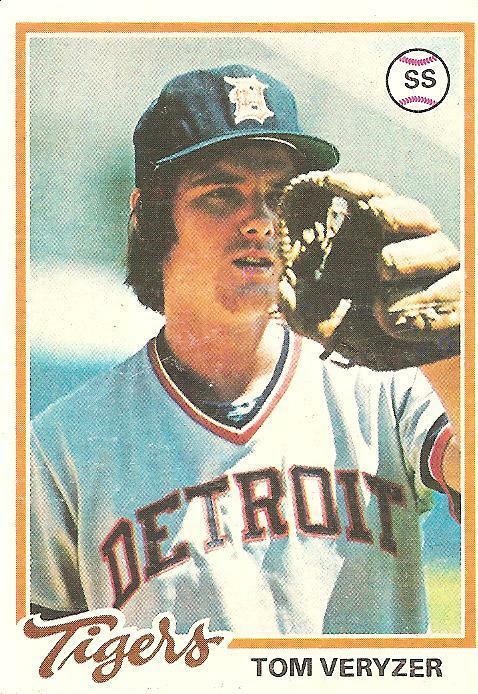 The novelty of having the Detroit 2B/SS cards that weren’t Lou Whittaker and Alan Trammell was fascinating to me… They were the only middle infielders the Tigers had from the time I could remember until after I was out of high school. When I was eight years old, it seemed otherworldly that anybody else would have played those positions.